XCAR (extended customer analytic record) refers to the concept of a single object—any entity that is the subject of your decision strategy—that is extended with data from multiple sources. For example, you can extend a customer record with purchase data, subscriptions, activity on social platforms, and so on. You store and manage XCAR objects in a Cassandra-based Decision Data Store data set. You also can now update single properties in XCAR without having to update the full customer record every time. 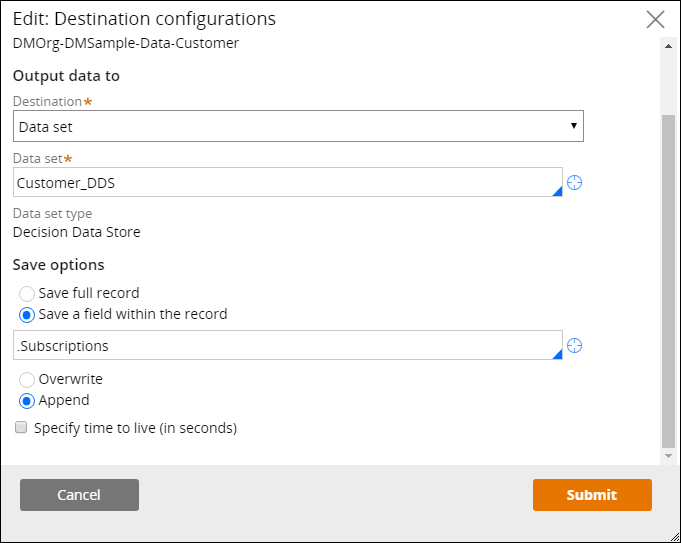 You can create a set of properties that are exposed in the Cassandra-based Decision Data Store data set that is provided by default as part of Pega Platform. You can update an embedded property of type page or page list of an XCAR without having to update the full record. For example, you can update the number of impressions within the last 30 days or update the average number of purchases over the last week. You can append an element to an embedded property of type page list of an XCAR without having to update the full record. For example, you can add an interaction history item or a purchased item to an XCAR. 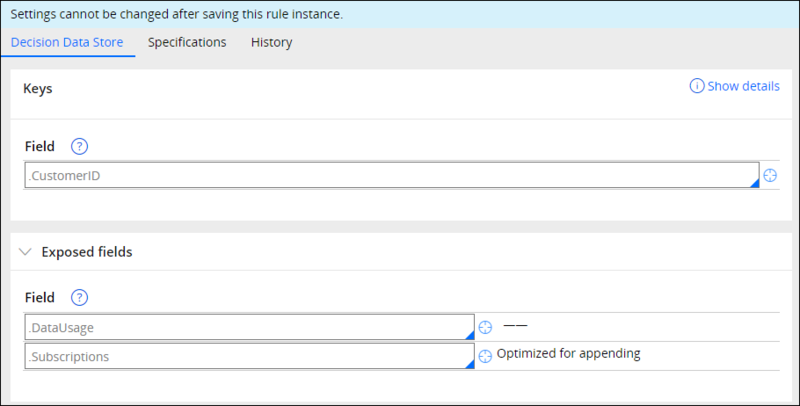 The Decision Data Store rule form contains the new Advanced section where you can define a set of exposed properties. When you choose to display a property, Pega Platform adds that property as a separate column in the Cassandra database. By having properties as separate columns in the Cassandra database, you can save processing time by updating individual properties instead of the full customer record when, for example, a property that is part of a customer record is updated frequently. For more information, see About Data Set rules. When configuring a data flow Destination shape, you can choose to update only a single property. You can choose any page or page list property from the data flow Applies To class. It is recommended that when selecting the option for single track update, you choose an exposed property to save processing time. 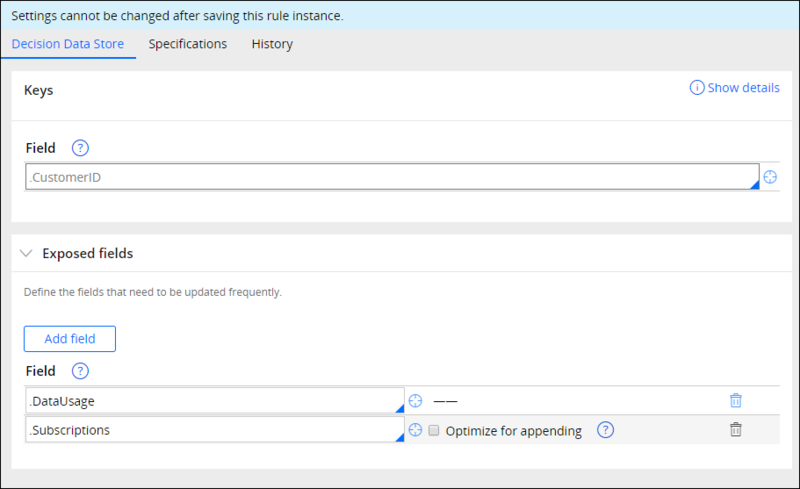 If you want to append a property value, the selected property must be of type page list and it also must be defined as an exposed property in the source Decision Data Store data set. 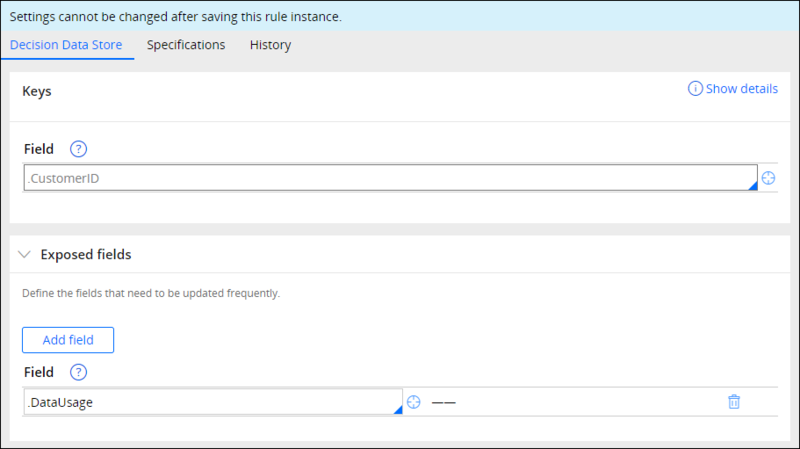 For more information, see About Data Flow rules.